Accepted manuscript on THz diffraction induced transparency in arrays of detuned resonators. In this manuscript we demonstrate that a periodic array of resonant rods with detuned frequencies can lead to an almost complete suppression of the extinction (nearly 100% transmission) and to a large group velocity reduction. We have termed this phenomenon Diffraction Induced Transparency. 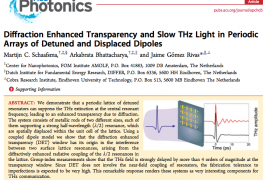 The manuscript has been published in ACS Photonics and can be found here: Diffraction Enhanced Transparency and Slow THz Light in Periodic Arrays of Detuned and Displaced Dipoles , ACS Photonics 3 (2016) 1596–1603. Previous: Previous post: Publication on effect of layer height for luminescent materials coupled to plasmonic arrays. Next: Next post: Publication on vectorial mapping of near-fields of THz resonators.